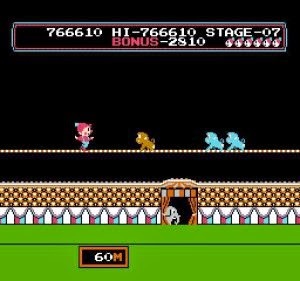 Circus Charlie is an action platformer that started life in the Arcades (1984) before being ported to the Famicom in Japan. It has five different events - jumping through flaming hoops on a lion; tightrope walking; ball to ball jumping; horse riding while jumping over walls; and trapeze. The aim is to avoid the range of obstacles in your way (i.e. fire rings, jumping monkeys, walls) and reach the podium at the end where you'll be serenaded with cheers from the crowd. The first few events are easy and pose little challenge to anyone with good hand-eye coordination. By far the hardest event is the final one which sees you bouncing on a trapeze while trying to grab hold of swinging ropes. It's like an advanced version of Jungle Hunt on the Atari 2600 but it's the least intuitive event and it does take a bit of time to get used to. Luckily the controls are very responsive and once you get used to the rhythm of the ropes you'll find it a bit easier. After you've completed the last event the game loops back to the first stage with an increased difficulty level, and you keep going until you lose all of your lives. I was really impressed with this port of the arcade original although it is missing the trampoline stage. The music is excellent and really matches the theme of the game. The graphics are functional at best with little to no animation in the background which is repeated across the stages. However, while it might not be a looker it more than makes up for things in the gameplay department. It's just a shame that it was only released in Japan on the Famicom as it fits in perfectly with other high-score titles such as Pac-Man and Donkey Kong. How much enjoyment you get out of Circus Charlie depends on whether you enjoy early arcade games where the only objective is to beat your previous score. For me, it's a nice game to occasionally return to for a quick 20 minute blast. Random trivia: Circus Charlie has been ported to a number of systems over the years including the Commodore 64, MSX, PlayStation (Konami Arcade Classics) and even the Nintendo DS (Konami Classics Series: Arcade Hits).